We have received nominations for the Executive Board positions (see the 2/8/19 post below). The seats for the part-time faculty Co-President, two part-time faculty Executive Board Members, and two at-large Executive Board Members are uncontested and, therefore, do not require a vote. There are three nominees for the two full-time faculty Executive Board Members. Per PFF’s Constitution, electronic ballots for full-time faculty who are PFF members will be emailed this Friday. The ballot will be open until April 5, 2019. Full-time faculty: if you believe you should have received a ballot on 3/13/19 but did not, please contact Organizer Debbie Forward at debbieforward1@gmail.com. Welcome to the Spring Semester, 2019! As you well know by now, the Supreme Court’s decision on Janus changed how public sector unions collect dues and fees. However, Janus also impacts the union’s Duty of Fair Representation. For a more thorough explanation of when and how PFF represents a faculty member, please see the attached chart. 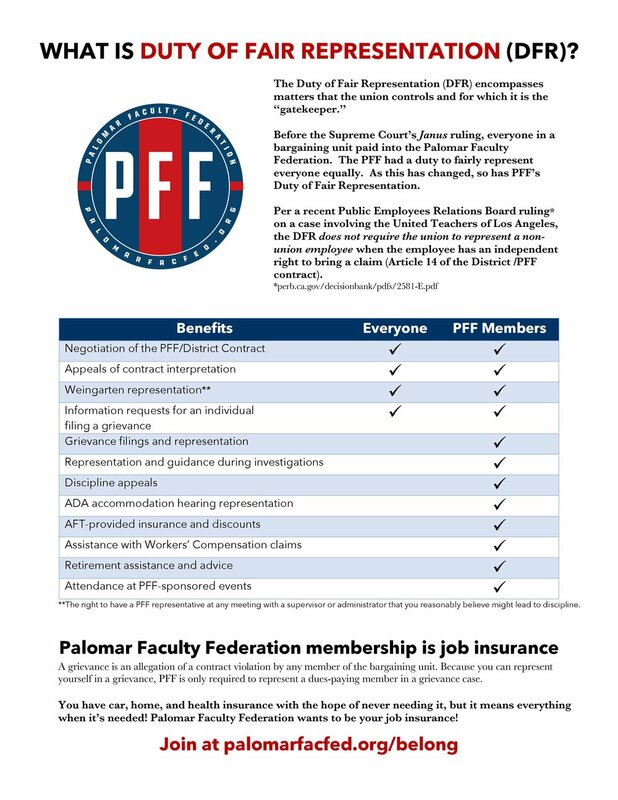 Just a friendly reminder from PFF, your faculty union, that the Part-time Office Hour Verification Form is due in your department by November 14th for you to be paid. The form can be found on Human Resources' website. Whether you're a member of PFF or not, the union has a legal and ethical responsibility to represent you in any meeting where discipline may occur. This flyer explains your rights. Have you been looking for a way to get involved in the union? Help decide the direction your union will take? Be involved in decisions that will directly affect the working conditions of faculty and the learning conditions of your students? To qualify, you must be a member of PFF and be able to attend most of the meetings. Those are held from 4:00-6:00pm on the second and fourth Thursdays of the month when school is in session. The majority of the meetings are on the main campus in AA 140, and we are looking at scheduling a few at the other centers. For more information, you can reply here or contact one or both Co-Presidents directly (Teresa Laughlin, tlainelaughlin@gmail.com or Barbara Baer, 63demeter@gmail.com).